I have been told that the ball travels well in the warm, dry weather of Arizona. I imagine Fordham Softball would agree. The Rams went 4-1 at the Hillenbrand Invitational in Tucson, Arizona over the weekend, using a combination of strong pitching and power at the plate to get off to their best start since 2013, when they also went 4-1 to open the season. 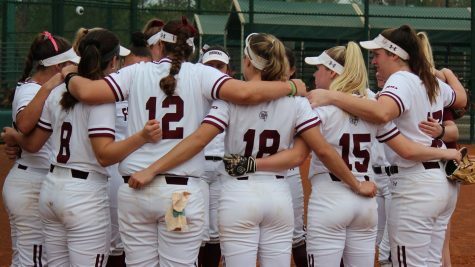 Fordham began its long weekend in the Southwest with a double header on Thursday against Baylor and Arizona. Lauren Quense was the star of the first game against #21 Baylor, which the Rams won, 1-0, behind a complete game shutout from the senior pitcher. She allowed seven baserunners on five hits, a walk and a hit batter, while striking out four. The biggest threat against Quense came in the third, when Baylor RF Kyla Walker bunted to advance the runners to second and third with two outs, but the Rams’ starter was not fazed, as she struck out Ari Hawkins to put an end to the threat. The sole run of the game came in the fifth, when Fordham 2B Jessica Hughes launched a solo shot out to left-center. The Baylor Bears were unable to get that run back against a dominant Quense, who had a 1-2-3 seventh to end the game. The Rams’ second game of the day did not go as well, as they fell, 8-1, to #10 ranked Arizona, who was hosting the tournament. 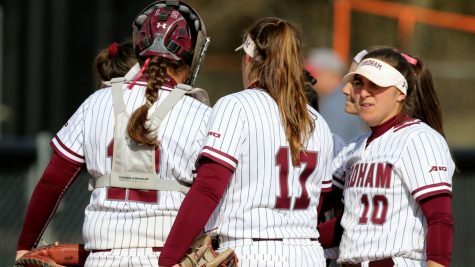 Freshman Madison Auginbaugh got the start for Fordham and received a rough introduction to college ball, as she was shelled for six runs (five earned) in three innings. 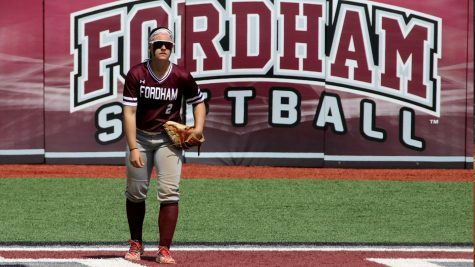 Fordham got on the board first, courtesy of an RBI single by CF Sydney Canessa to score Amy Van Hoven in the top of the first. But Arizona responded in the bottom of the inning when Alyssa Palomino’s RBI single that would have just tied the score, developed into a three-run debacle as both RF Chelsea Skrepenak and catcher Ally Vergona made errors on the play, allowing Palomino to come all the way around and score. And that would be the game, as Arizona added three more runs off of Auginbaugh before she gave way to fellow freshman Taylor Stocks. Stocks pitched well to end the game, allowing just one earned run (one unearned as well) in three innings while striking out three. After a 1-1 Thursday, the Rams had only one game on Friday, as they staved off a late comeback to defeat Tulsa, 7-6. 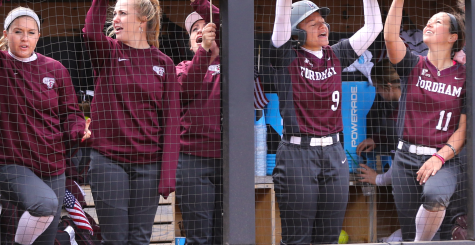 Fordham jumped out to an early lead when Jessica Hughes hit her second home run in as many days, this time a two-run shot over the left-centerfield wall. The Rams tacked on two more by the fifth to take a 4-0 lead. Meanwhile, Lauren Quense, who was named Atlantic 10 Pitcher of the Week this week, was dealing, having not allowed a run over the first four innings. But in the fifth, Tulsa RF Julia Hollingsworth homered with two on to make it a one-run game. 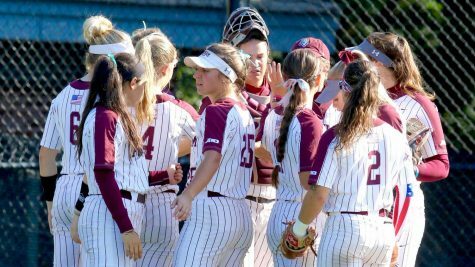 Fordham came right back in the sixth when freshman Skylar Johnston hit her first career homerun, a two-run shot. The Rams added one more run to take a 7-3 lead going into the bottom of the seventh. 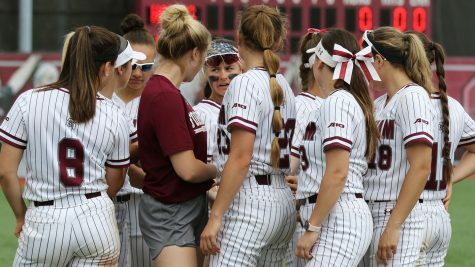 But Tulsa rallied to knock Quense out of the game with a home run, and made it a one-run game when Sarah Kosmata came through with a two-run, pinch-hit single. 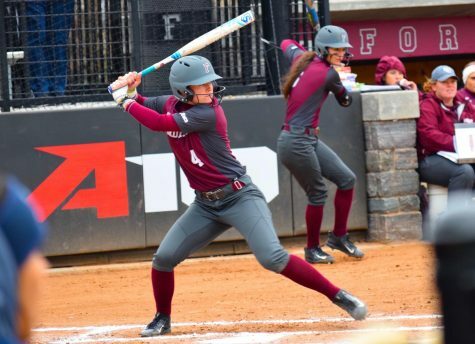 Finally, Madison Auginbaugh was able to get a groundball to end the game and give Fordham a tight win. Coach Orchard’s squad was back on the diamond Saturday for another doubleheader, this time against California State University, Northbridge (CSUN) and Northwestern. Madison Shaw was the hero in the first game, against CSUN. With the game tied, 3-3 (thanks to a home run by Sydney Canessa) in the bottom of the seventh, Shaw connected for a walk-off, solo homer. Madison Auginbaugh, who started on the mound, also had a great game, allowing just three runs and striking out five as she pitched her first ever complete game. 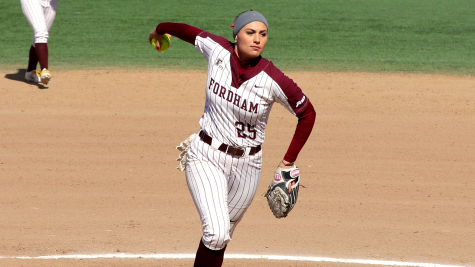 Quense may have felt the need to show the freshman who was boss, as she came out Fordham’s next game, against Northwestern, and turned in a gem of a start, just slightly better than Auginbaugh’s. 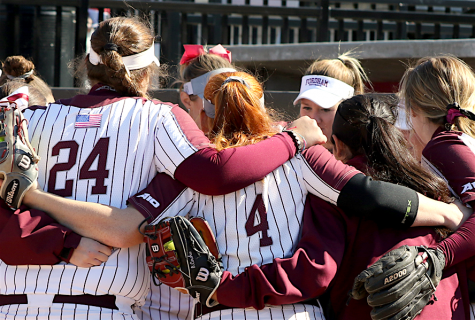 The senior tossed a complete game, allowing three runs and striking out seven as Fordham won their fourth game of the weekend, 4-3. Quense also took the lead at the plate, hitting a two-run single in the third that provided the final margin of victory for the Rams. 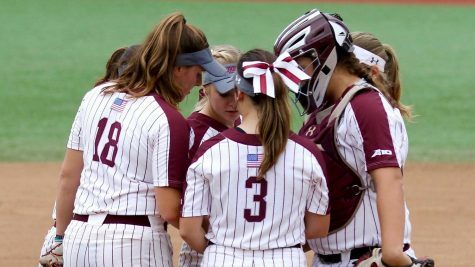 The 4-1 record from Arizona is an impressive one, and the Rams have received votes in the first edition of the USA Today/NFCA poll that put them at around 30th in the nation. Things look good for the Rams going forward, as it appears that Quense may be able to step into the role of dominant starter left open by Rachel Gillen’s departure, and that Auginbough or Stocks could be very capable deputies. The Rams are next in action on Friday, when they take on Bryant University as the first part of a doubleheader. That will take place in Greenville, North Carolina, where the Rams will be all weekend for the Pirate Clash tournament.